Post break-up, the BJP and PDP are at war. And ironically both of them are accusing each other of not living up to the Agenda of Alliance (AoA). During his grand rally in Jammu to mark "historic martyrdom anniversary" of Jana Sangh founder Syama Prasad Mookerjee, BJP leader Amit Shah said that the Mehbooba Mufti-led government did not implement any of the programmes framed by the central government. He also accused the PDP of discriminating against Jammu and Ladakh. In response, Mehbooba said the discrimination against Jammu and Ladakh had no basis in reality as the BJP was an equal partner in the coalition government and its ministers “largely represented Jammu region". Mehbooba said her party’s commitment to the ‘Agenda of the Alliance’, the pact reached between the two sides in 2015, never wavered. Mehbooba also said that it was sad to see the saffron party disown its own initiative and label it as a "soft approach". So what is the truth? Which party is lying and which is telling the truth? Let us do the reality-check. Truth is that the Agenda of Alliance has largely been implemented in breach. Let us check the coalition’s performance on some of the key points in the agenda. AoA promise: The coalition government will seek to support and strengthen the approach and initiatives taken by the government to create a reconciliatory environment and build stakes for all in the peace and development within the sub-continent. Reality: Indo-Pak relations have plunged to their lowest lows in the past four years. New redlines marked by the Centre for dialogue with the neighbour which includes bar on Islamabad talking to Hurriyat and the intermittent high-profile terror attacks from across the border have ensured that the dialogue between the countries hasn’t got off the ground. AoA promise: The present position will be maintained on all the constitutional provisions pertaining to J&K including the special status in the Constitution of India. 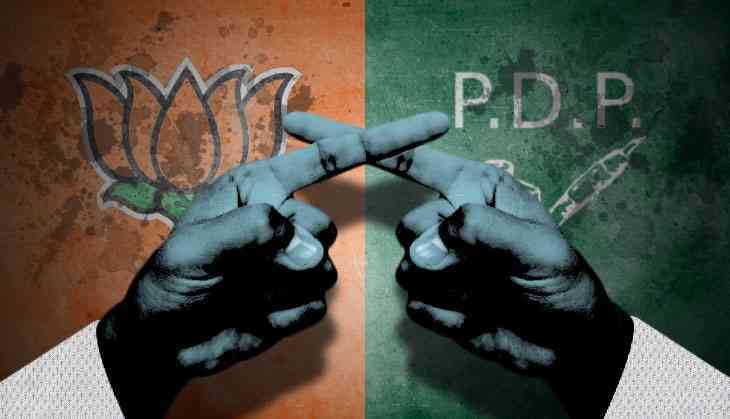 Reality: Though at a political level the BJP has chosen to largely lie low about its longstanding position on the sensitive issue, J&K’s special constitutional position has faced increasing legal challenge in recent years. Several petitions have been filed in the Supreme Court, one of them by the RSS allied Kashmir Study Group, against Article 35A, the constitutional provision extended to the state by the president of India in 1954 which enables the state government to define the state subject and forbid outsiders from settling in the state to preserve the existing demographic composition of the state. AoA promise: Examine the need for de-notifying disturbed areas enabling Union government to take a final view on the continuation of AFSPA. Reality: The BJP went back on the commitment soon after forming the coalition government. However, the progressive deterioration in the security situation and the resurgence of militancy – contributed no less by the muscular policy of the Centre – dented the PDP’s argument for AFSPA's revocation. AoA promise: Will strengthen cross-LOC trade, encourage civil society exchange, open new routes. Reality: Once dubbed as the biggest Confidence Building Measure between India and Pakistan, the cross-LoC trade now struggles and has become less and less profitable. For one, the trade has not moved beyond barter system and the Union government has not taken any step towards opening new routes, increasing trade commodities from current 21 and start telephone services between the two sides. AoA on internal dialogue: The coalition government will facilitate and help initiate a sustained and meaningful dialogue with all internal stakeholders to build a broad based consensus on resolution of all outstanding issues of J&K. Reality: From the day one of this coalition, the Centre has refused to engage with the separatists. In fact in April 2017, the Centre told the Supreme Court it was ready to talk to only recognised political parties in Jammu and Kashmir to resolve the crisis but not to the separatists. It also opened investigations against the separatists over their alleged role in funding militancy in the state and has since put seven of them including the top separatist Shabir Shah behind bars. AoA on power projects: Explore modalities for transfer of Dulhasti and Uri hydro power projects to J&K as suggested by the Rangarajan Committee Report and the Round Table reports. Revise all royalty agreements. Reality: There has virtually been no progress on this. In fact, the then Union Power Minister Piyush Goyal made it clear in the first few months of the coalition government that no power project was going to be transferred to J&K government. The minister also ruled out revision of royalty agreements between the state and NHPC on the latter’s owned projects in the state. AoA on flood relief: Rehabilitation and Relief for the Flood Affected victims and their families: The Government of India (GoI) must fully fund the rehabilitation and reconstruction plan. Rs 44,000 crores demand made by previous government. Reality: It took the Centre, fourteen months to release the flood relief package to the state. The amount released was a meagre Rs 7,854 crore against Rs 44,000 crore sought by the state government. A part of this money had also to be spent on the river Tawi flood reconstruction project in Jammu. Yes, both Jammu and Srinagar got the smart city status in line with the agreements in Agenda of Alliance. Also an AIIMS like hospital has been sanctioned each for Jammu and Srinagar, again a commitment made in the AoA. So the state government has hardly been a success. On the contrary, the coalition has always been hobbled by the recurrent political and ideological confrontation between the partners which in turn has affected the governance. Besides, more often than not the BJP’s ideological overreach has brought the state to the edge of political chaos. J&K at the end of the four year PDP-BJP rule is worse than it ever was since the early nineties. Militancy has staged a return with a vengeance. More local youth are taking up arms undeterred by the Operation All-Out and the Valley is once again rife with the separatist sentiment. Don't use LIC to bail out failing banks, Mr Modi. Is this the reform you had promised? READ NEXT >> Don't use LIC to bail out failing banks, Mr Modi. Is this the reform you had promised?